I kind of like the idea of a photograph having an actual sound. Let me explain a little bit about that theory. 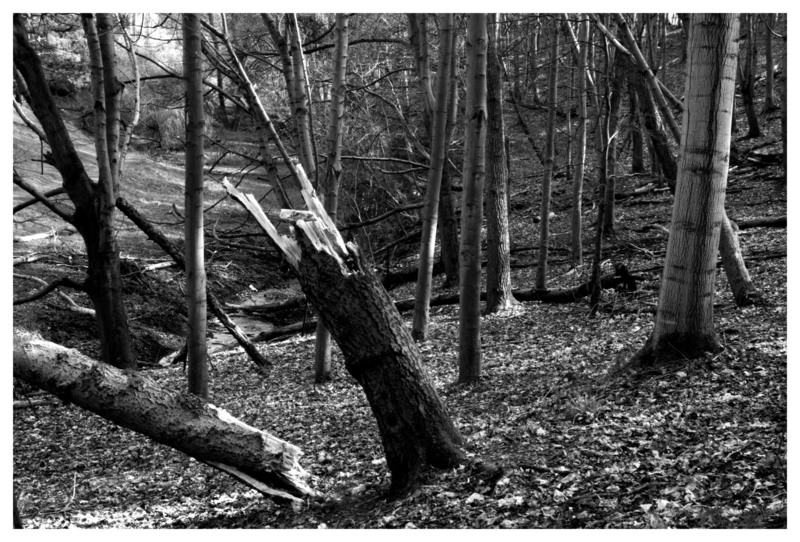 If you look at this photo and imagine the cracking sound this tree made when it finally toppled over, imagine also the noise it made as it most likely snapped several branches from other trees on its way down. Every time I look at this photo I can help hearing that lovely dry cracking sounds of branches breaking, I can’t say it happens with every photo but I do hear sounds in them from time to time. There are also plenty of occasions when I can get a sense of smell from some photos, I love the way certain images can evoke a particular smell………….please tell me you agree with me and I’m not just going completely mad. Anyway, this one was taken quite recently during my trip down the Furry Glen. It was quite an awkward shot to capture, I had to set up the camera on quite a steep slope and delicately balance the tripod on shifting ground. I think it was worth the effort. Somebody just mentioned to me that it looks like some giant bear has been on the warpath through the woods, I replied “Trust me, if there were bears in the Phoenix Park I wouldn’t have stood still for long enough to take this photo”, I like the idea though, it adds to the many fables I hear about the Furry Glen area. This entry was posted in Black and White Photography, Irish Landscapes, Phoenix Park and tagged Black and White, Furry Glen, Phoenix Park, Photography. Bookmark the permalink.